What a day! We are so amazingly stoked we were able to be photographers at Ashley and Kyle’s wedding because they have become lifelong friends. 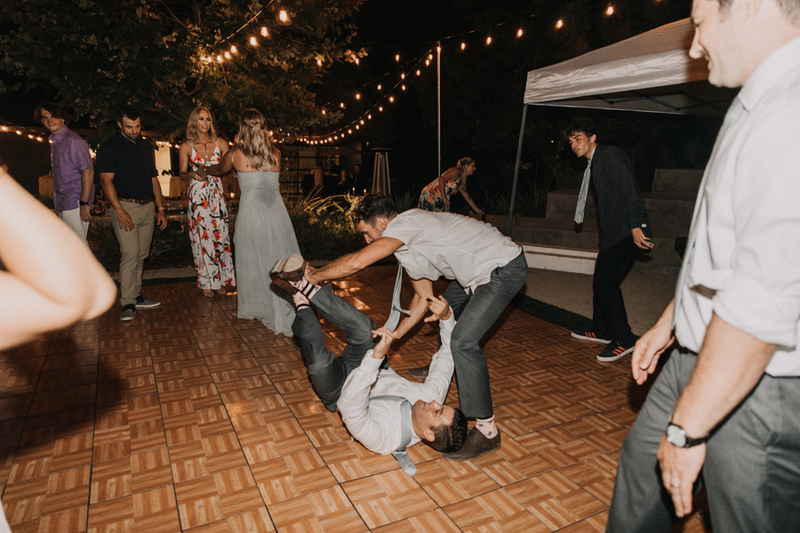 Break dancing, possibly the best charcuterie board we have ever seen, and a ceremony overlooking the Pacific coastline are just a few things that come to mind when we look back on the memories from their wedding. 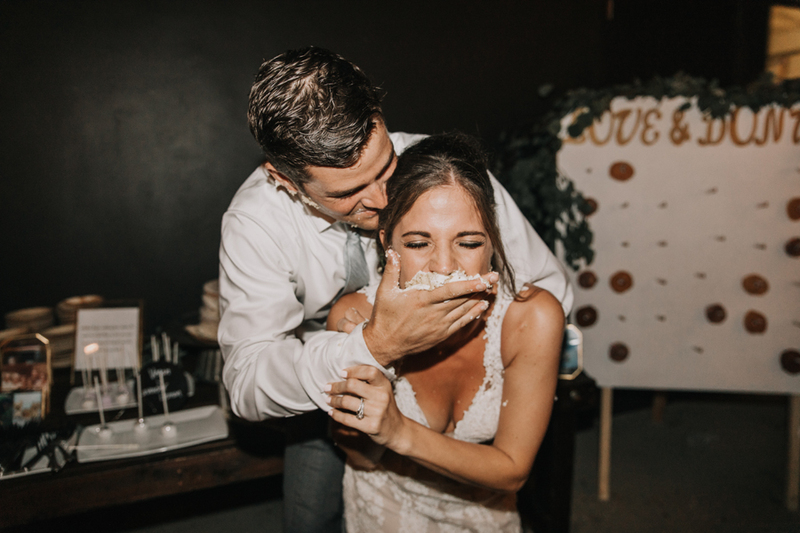 Kyle and Ashley are some of the most fun outgoing people we have been around, and their laid back, beachy personalities translated into the overall day of their wedding. Andy and I had to laugh throughout the day when we thought of how chill and relaxed everything was going. 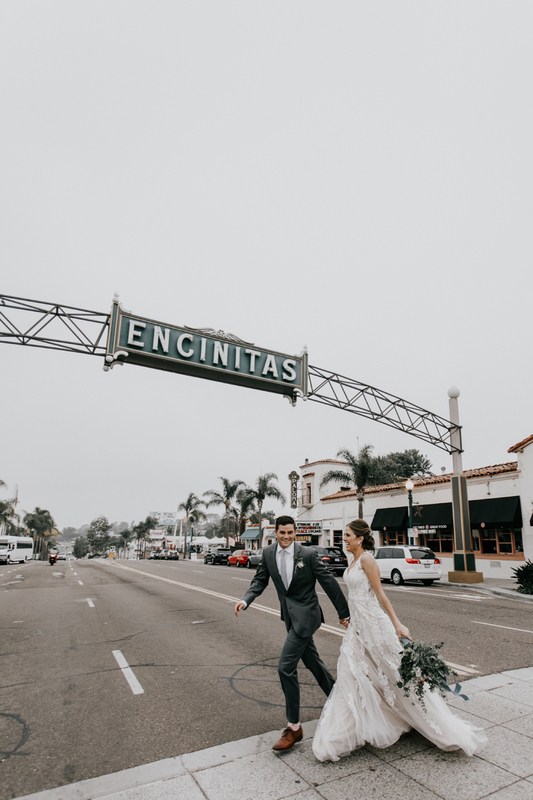 Encinitas is their hometown, and it only made sense for them to get married at the beach, followed by their ceremony at The Lux Art Institute just down the street. Check out a few favorites below, Enjoy! A: Our wedding day had so much personal touch and personalized inspirations behind it. Most of what we had encompassed who we are and things we love as a couple. From the subtle dusty colors, to the greenery, vendors and food, everything was picked not because it was suggested to us or because we had restrictions and could only pick from a list of particulars items and vendors but because they were companies, vendors, and aspects that we loved in our everyday life and were locally sourced vendors and companies. Having a wedding that encompassed the city we love most, the vendors we love most and things we support in our lifestyle such as shopping locally and being environmentally friendly, was something we wanted to be sure to incorporate. 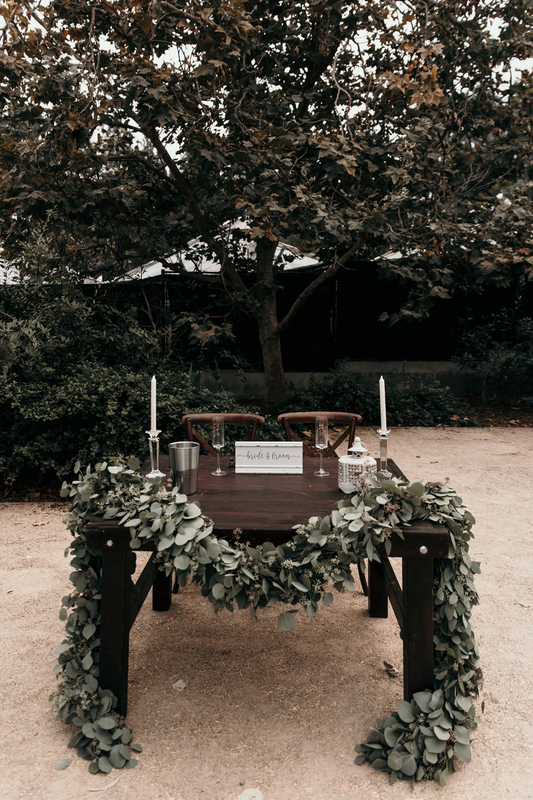 The themes we went with was more of a french rustic greenery styled wedding with a touch of farm house (I know, a big mixture), but it ended up looking beautiful and exactly how we envisioned it! Neither of our religions played a part at our venue. We said a few prayers at our ceremony and that was the furthest we got into religion at our wedding. A: All our decor was bought and made by friends and family. Majority of our decor was rustic lanterns, wooden charcuterie boards and plants. Any of our decor that was not lanterns, charcuterie related or plants, were either bought with the idea that family members could use them after the wedding or they were made by friends who own their own businesses and whom we wanted to support! A: Because I (Ashley) grew up in a family where literally everyone was a green thumb fanatic, This was one of the most important parts of our wedding. I was sure our florist was going to hate me for how crazy I was over making sure the flowers and greenery were absolutely prefect (side note, he didn't hate me and is an absolute gem!). Our flowers consisted of a TON of greenery, but very specific greenery; true blue eucalyptus, seeds eucalyptus, silver dollar eucalyptus and willow eucalyptus. It was also very important to me to have touches of rosemary in every bouquet since rosemary is a natural calming agent (just in case myself or anyone else got a little too stressed out). For the actual color and floral portion, I am very picky with flowers so this was a hard one. No roses or carnations were allowed to be apart of anything in our wedding. However finding the perfect white floral piece was so hard. My first pick was white anemones which was unfortunately not in season. By the time we finalized our flowers we ended up with white Queen Anne's lace, blue thistle, queen protea's, white dahlias, dusty miller, bears grass, rosemary and tons of greenery garland all over. We also had the corsages, boutonniere's a wretch for my girl dog, and a floral hair piece all of which included a mixture of everything we went with. Our flowers had to be one of my favorite parts of our wedding! A: Every part of our day was completely personalized. Having a ceremony location and venue that allowed for us to start with a blank canvas and have little to no restrictions on imagination was very important to us. We chose to get married in Encinitas which is a very important city in our relationship. It was the first place we moved to, the first of many firsts happened in that city and it is the only place we can still go to and feel more at home than anywhere in the world, so getting married at the Moonlight Beach Overlook was without question! For our ceremony we picked an art institute, also in Encinitas, that also allowed for the same blank canvas we had at the beach. The venue we chose puts the money made from weddings and events, back into the school and art community , which was very important to the both of us. Everything inside and outside was completely transformed into a rustic french style greenery farm house (or at least thats how we imagined it) with a touch of art from the institute all over. Our favorite parts of our wedding was our charcuterie wall and the market lights that set the most amazing mood for all of our guests as well as our caterers who had the most amazing attitudes and food! Q: Let's talk fashion. How did you both choose your wedding day look? Describe the looks in detail as well as what you were looking for in a photographer. A: For me my wedding dress was not something I always envisioned to be a particular style, shape or color. In fact, I really had no idea what I wanted, I just wanted it to truly encompass who I am as a person. I ended up working a few months at a wedding shop (BHLDN) and in all honesty, found the dress I knew was mine within my first week working there when I put my first bride into it. It was the most whimsical yet boho dress with the perfect amount of detail, last, buttons and elegance. I couldn't have loved a dress more! For Kyle, he is one to wear a bowtie to every occasion, this time he decided a skinny tie would best fit this special occasion. He picked a weathered grey suit to match our dusty blue and eucalyptus green color scheme along with his favorite nut brown wingtip styled shoes. Both of our looks were picked completely separate to encompass us as individuals and ended up being a perfect collaboration of style together. As for our wedding photography, we knew we wanted someone who would not pose us and was a local beach photographer in San Diego. A: Marrying my best friend surrounded by my closest friends and family! It was so awesome to work with Kyle and Ashley. Being how important the beach plays into our own personal lifestyle, it was great to be able to celebrate their wedding at the beach. 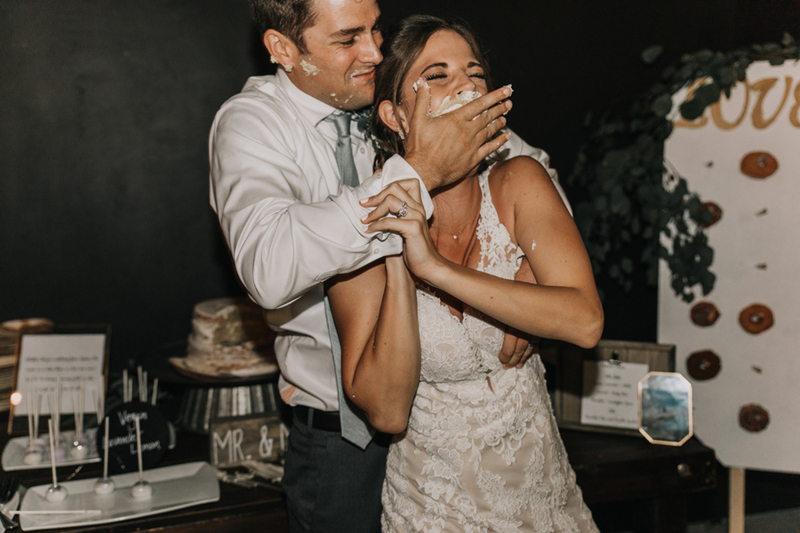 If you are looking for a beach wedding photographer or searching for areas to have your wedding at on the beach in San Diego, make sure to reach out as we have tons of recommendations of venues and areas to have your wedding here in San Diego. We are local San Diego wedding photographers and live in Pacific Beach. We love living here in San Diego and having so many different options for places to shoot at the beach! From the caves at Sunset Cliffs all the way up to the pier in Oceanside, there are so many different unique areas for engagement photos or beach weddings. If you are looking for new locations that have not been overdone make sure to shoot us a message! Can’t wait to talk soon.